Alaska is known for its many fisheries, which support an extensive global marketplace, a thriving tourism industry, and also contribute much to diets of many Alaskans. Yet, some research has suggested that Alaska’s food security has been impacted negatively by the development of export-oriented commercial fisheries and tourism-oriented sport fisheries. In this paper, we discuss two sets of interviews that we completed with participants in two food fisheries in the Kenai Peninsula region of Southcentral Alaska: sockeye dipnet fishing and razor clam digging. We encountered a great deal of cultural and socioeconomic diversity among the participants of each, though a far greater proportion of the clam fishery were Alaska Native than in the salmon fishery. In both fisheries, people report participating both as a matter of food security and family tradition. Likewise, participants in both fisheries reported a great deal of experience with and knowledge of the fisheries. Many clam diggers worried that the fishery was being overharvested, despite the apparent abundance of clams that year, and this proved prescient to the fishery’s closure 2 years later. In the salmon fishery, some people were similarly concerned about the sustainability of the fisheries. Ultimately, our paper provides a descriptive account of participants in these two fisheries and sheds light on how important wild food harvests can be to the food security of Alaska’s urban residents. We recommend that future resource management policies continue to support the role of fisheries in local food security. Alaska is known for its many fisheries, which support an extensive global marketplace, a thriving tourism industry, and contribute much to diets and food security of Alaskans [1–3]. These fisheries have a widespread reputation for sustainability, and while in many cases this reputation is well deserved , recent declines in regional fish populations and inequities in how the benefits of these fisheries are distributed (both in terms of profit and food) have brought into question how this sustainability is being evaluated . Among the primary issues of concern to Alaskans regarding their fisheries is food security, and the role that fisheries currently play, and could be playing, in ensuring food security for people in both urban and rural parts of the state [1, 6, 7]. In rural Alaska, which is characterized by small, remote communities not connected to a state-wide road system and peopled primarily by Alaska Natives, wild fish and game are an essential component of people’s diets and household economies , so it is not surprising that disruptions in fisheries could have significant consequences. In urban centers such as Anchorage, Fairbanks, and their surrounding areas, wild fish and game play a smaller role , though exactly how much fish and game urban residents consume is not well known . Generally speaking, commercially caught seafood is not widely marketed in the state and is instead marketed “outside” the state, in Asia and the “lower-48” states of the USA. This has improved some in recent years, for example through community-based fisheries programs, inclusion in local school lunch programs, and direct marketing to restaurants and farmers’ markets ; nevertheless, most Alaskans who utilize wild foods in urban areas obtain it through barter, trade, or most commonly, by harvesting it themselves [1, 9]. Research in Alaska and elsewhere on the role of wild foods in food security and culture has generally emphasized rural communities [6, 10–13]. Increasingly, however, the importance of wild foods in urban communities is being explored [2, 14]. A recent publication by the Alaska Department of Fish and Game (ADF&G) lists urban residents as harvesting roughly a third as much fish and game as rural residents in the state , which is noteworthy given that more Alaska Natives now live in the state’s urban areas than rural villages. In Alaska and elsewhere, it is also documented that many low-income urban families rely on food sharing from friends and family still living in rural areas [9, 12, 14]. Likewise, research in Alaska’s Kenai Peninsula shows that food security outcomes for low-income residents are improved by access to local seafood . Finally, the importance of subsistence harvests of food and medicines in urban ecosystems, for example from the forested spaces of Seattle, has also been documented . Given the challenges that urban low-income residents often face in terms of access to healthy and affordable store-bought foods (e.g., food deserts) [16, 17], it is imperative that food security research continues to explore the role of wild food harvests in achieving more healthful and sustainable outcomes for urban families. In this study, we discuss two wild seafood harvests that are popular among residents of the largest urban and peri-urban region of Alaska: dipnet fishing for salmon on the Kenai River and clam digging on the beaches of the Kenai Peninsula. Our goal is twofold: to provide descriptive information on these understudied aspects of the food system and to also contribute to the broader discussion of wild food harvests in the lives and experiences of urban residents, where the issues of people’s connections with nature, tradition and self-determination, sustainability, and social and environmental justice all arguably converge. As noted above, wild-caught seafood plays an important role in the lives and livelihoods of Alaskans, rural and urban alike, and this is certainly the case for residents of Alaska’s largest urban area, the Matanuska-Susitna Valley and Cook Inlet watershed, located in the Southcentral region of the state. Cook Inlet is a stretch of the Pacific Ocean that reaches 180 miles along the west coast of the Kenai Peninsula, from the Gulf of Alaska to Anchorage, Alaska’s largest city (Fig. 1). The Cook Inlet watershed spans approximately 100,000 km2, with major rivers including the Susitna, Kenai, Matanuska, and the Kasilof. The watershed, and most notably the Kenai River, is home to all five species of North America’s Pacific salmon (Oncorhynchus spp. ), as well as over half of Alaska’s total population—more than 400,000 people. The majority of these residents live in the city of Anchorage (pop. 291,826 in 2010) and the surrounding area, including the Matanuska-Susitna Borough (commonly known as the Mat-Su, pop. 88,995 in 2010). The Kenai Peninsula itself hosts a population of approximately 55,000 people, living primarily in small communities of under 5000 people along the road system. The Kenai River is especially important in the region with respect to fisheries. The river stretches 82 miles from its source in Kenai Lake in the Kenai Mountains to its mouth near the cities of Soldotna and Kenai. The smaller Kasilof River is also important to local fisheries; it runs 17 miles from Tustumena Lake to where it empties into the inlet south of the Kenai River near the town of Kasilof. Both rivers are popular sport fishing destinations due to their historically abundant salmon runs, presence of highly sought after king salmon, and proximity to the road system. The personal use salmon fishery in the Kenai Peninsula, commonly referred to as dipnetting, takes place on the beaches along the mouths of both rivers, which also act as busy corridors for the commercial fishing fleet. The personal use salmon fishery on the Kenai River is open for 21 days each July, beginning on July 10 and running until July 31. The fishery is typically open between 6 am and 11 pm every day, but those hours may be extended by ADF&G, who are responsible for management of the fishery. Harvest limits are set to a seasonal household limit, a seasonal amount that may be taken in combination from all available personal use salmon fisheries in Cook Inlet or entirely from any one personal use salmon fishery. Fishers are required to record their catches on their personal use permit before leaving the fishing site. Fishers must also “mark” their personal use-caught fish by clipping the fins—a method intended to prevent the fish from being illegally sold. Permits must be submitted to ADF&G after the closure of the season so that ADF&G officials may estimate the total personal use take, though compliance with this regulation has been steadily declining since permits were first issued in 1996 . Regulations also allow for a proxy permit that enables Alaska residents who are over the age of 65, blind, or have significant physical disability, to have someone fish in their stead, but any fish caught must be given to the actual permit holder. The Kenai River dipnet fishery, on which our study is focused, is extremely popular (Fig. 2); an average of 426,000 sockeye salmon have been harvested per year from the Kenai River alone by dipnetters since 2010 . Assuming a harvest of 25 fish per person (the individual limit), that is roughly 17,000 fishers per year. For all the Kenai Peninsula dipnet fisheries, an average of 34,400 permits have been issued per year since 2010 . Dipnetters typically target sockeye salmon, though other species of Oncorhynchus may also be harvested depending on seasonal restrictions. Fishing is generally done either from shore or from small watercraft within the first six river miles of the Kenai, though we witnessed some especially avid fishers in dry suits floating just off the beach attempting to catch fish in the river channel itself. The areas of beach available for shore-based fishing are several hundred yards long and are subject to two tidal cycles per day, significantly decreasing the amount of space available for people during the high tides. Similarly, the space available in the river channels where fishers dipnet from a boat is especially limited during low tide, which can cause severe boat traffic congestion and “combat” fishing conditions during peak dipnetting season. Personal use clam digging (Fig. 3) has also been a historically popular activity for residents of the region. The species being harvested are Pacific razor clams, a soft-shelled bivalve that is common on the west coast of North America, from California to Alaska, and these have historically been abundant on beaches on both the east and west shores of Cook Inlet. In 1969, an estimated 8600 trips were made to the Cook Inlet beaches, resulting in a harvest of over 250,000 clams . In the mid-1980s, trips to the beaches rose about 31,000 annually, increasing the harvest to upward of one million clams . In more recent years, the fisheries have remained active, but harvests have steadily declined, to an average of just under 400,000 clams for the 5 years prior to the fishery’s closures in 2014 . Clams can be dug year-round in Cook Inlet, though most digging occurs from April through September, and the most preferable time in terms of the quality of the meat happens in early summer before the spat (spawn). Most people targeting razor clams concentrate on a 50-mile area between the Kasilof and Anchor rivers, with Clam Gulch Beach and Ninilchik Beach being two of the most popular locations on the east side of Cook Inlet. As of 2015, beaches on the east side of Cook Inlet were closed to clam digging. Despite appearing to be especially abundant in the early 2000s, the razor clam populations are now considered a conservation concern . When sampled in 2008, Clam Gulch Beach held an estimated 3.6 million clams in 4 miles of beach. Another 2.5 million clams were estimated for Ninilchik beaches in 2005. By comparison, the surveys of Clam Gulch and Ninilchik Beaches in 2010 and 2014, respectively, showed that the average number of mature-size razor clams was 80 % lower in Ninilchik and 89 % lower in Clam Gulch than seen in the two prior decades . To our knowledge, no research is ongoing that explores the social impacts of these closures. Between July 10 and July 31 of 2012, both authors performed 71 interviews with personal use dipnetters fishing on the Kenai River.1 Because of the large number of people fishing and the physical and attentive requirements of dipnetting, we were forced to prioritize practicality in recruiting interviewees for this study. We selected candidates based on an informal encounter approach while candidates were fishing, cleaning fish, or resting/relaxing on the beaches at the mouth of the Kenai River. Our interview protocol was intentionally short (15–20 min), to minimize disruption to fishing activities. These interviews were spread as evenly as possible over the duration of the entire dipnet season, on weekdays and weekends, mornings, afternoons, and evenings. Each individual fisher’s participation was considered as equally important and valid for understanding the user’s perspective of personal use fishing on the Kenai River, and we attempted to recruit a diverse group of interview participants throughout the interviewing period. Participants were asked the same set of predetermined questions, including why and how long they have participated in the fishery, how they use their harvest, and whether they consider the fishery to be sustainable. With respect to sustainability, a definition was not provided, such that we might elicit people’s own notions of the concept . Interviews concluded with an opportunity for interviewees to express any additional comments. The second author performed similar informal encounter interviews in June of 2009 with clam diggers on Clam Gulch Beach and Ninilchik Beach. Both beaches are accessible by road and as noted above are among the most popular and heavily harvested. As with the dipnet interviews, interviewees were identified and approached in a quasi-random manner. Clam digging is only practical during minus (especially low) tides, and the second author was present for two of the largest minus tides of the month, one at each beach. The interview protocol was similarly short; questions were asked while people were walking and digging, or while relaxing over a campfire once digging had been completed. Twenty-six clam diggers were interviewed in total, 14 on day 1 (Ninilchik Beach) and 12 on day 2 (Clam Gulch Beach). Of the 26, 20 were women, 18 were Alaska Native, and 8 Caucasian. Fifteen lived in a community on the Kenai Peninsula, and the other 11 reported living in Anchorage. All 26 reported having dug for clams for many years; an average could not be calculated because some responded with such phrases as “as long as I can remember” and “all my life.” One Alaska Native woman replied, “we’ve done this forever,” emphasizing the traditional and customary importance of the practice to her people. When asked about why they dig, all 26 also responded that the clams were for food use. Seven mentioned that the clams are “free” or “cheap” and that this was important to them given the extremely high prices of food and fuel being experienced at that time in Alaska . Three diggers added a caveat that the clams did not provide a major source of food but were important for special occasions and for gift giving. Twelve noted that clam digging was something that they enjoy or find comfort in. 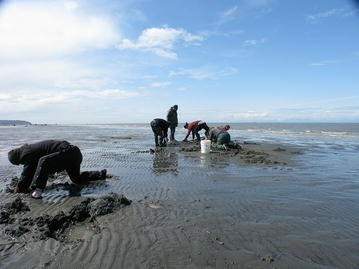 Generally, clam digging in Kenai is a quiet affair; one person called it “meditative,” and this contrasts notably with the frenetic atmosphere of dipnetting. Eight of the 18 Alaska Native discussed a family tradition of clam digging in the early summer, as did two of the Caucasian respondents. With respect to family, among all that were interviewed, only four were digging alone. The second author witnessed more than 20 children, varying in age, participating with their family members to some degree or another. One group digging was a collection of graduate students from the University of Alaska, though the individual interviewed hailed from the region and reported having dug with friends and family most of his life. Some groups of diggers brought with them recreational supplies such as chairs, food, children’s toys, and firewood in addition to the shovels, buckets, and wet gear necessary for digging. When the tides rose, at least four groups were observed cooking clams on the beach over campfires. The students had camping gear as well and reported that they were spending the weekend on the beach. When asked what people would do with the clams, that is, in terms of preservation and storage, 19 people mentioned freezing, six said they would can some or all of the clams, and five people mentioned smoking (note that these do not add to 26 because several people noted more than one). Nine harvesters also noted concerns about whether the clams would continue to be safe to eat in the future. Many specifically mentioned algal blooms, paralytic shellfish poisoning (PSP), or “red tide”; two mentioned “pollution,” and one talked about “climate change.” Four people concerned about the safety of the shellfish discussed the lack of local monitoring by the State of Alaska. We conducted interviews with 71 personal use fishers, 22 women and 49 men, over the course of 21 days. Of those fishers, 56 were from the Anchorage and Mat-Su Valley area, nine were from the Kenai Peninsula, and six were from elsewhere in Alaska. Of the 71, 47 are Caucasian (two of which identified as Russian), eight are Alaska Native, three are Polynesian, five are Asian American, four are African-American, and four are Hispanic/Latino. Though study participants reported a number of reasons for engaging in the personal use salmon fishery on the Kenai River, three specific themes arose with almost every respondent: issues of food security, time spent with family (and by extension, friends), and fishing as an important recreational activity. All but a few respondents cited using their harvested fish for food as a primary reason for participating in the fishery. While some prioritized the recreational aspect of fishing first, most respondents said they were fishing to “fill the freezer” and discussed the various ways by which they preserve salmon, such as smoking, freezing, and jarring or canning. Respondents indicated some degree of reliance on their fishing activities to supplement their diet through the winter months, ranging from “this is our meat for the winter” to “I am on food stamps. This [fish] helps,” to “we wouldn’t starve [without salmon] but we surely wouldn’t be able to afford eating as healthily without these fish.” Others confirmed the perceived importance of the nutritional value of salmon. One man fishing with his wife said, “We’re in graduate school so we need cheap but good food, especially with her [his wife] being pregnant.” Others described salmon as an important part of their “Alaska diet,” indicating they enjoy harvesting their own food and experience gratification for being self-sufficient in supplying their own meat source for the year. Some respondents said that if they were unable to catch their own salmon they would not choose to purchase replacement salmon, preferring or being forced to go without. Some fishers we spoke to were fishing for both themselves as well as someone else via proxy permit. Many fishers prioritized the personal value of dipnetting as an opportunity to spend time with friends and family. All but one of our respondents were fishing with either co-workers, friends or family members, and many parties included children, ranging in age from infants to teenagers. Several families described fishing as an important “family time” activity and indicated the importance of outdoor activities in teaching their children important life lessons, such as respect for the environment, hard work, and harvesting their own food. Many groups had designated a “site” on the beach with varying degrees of elaborate setups. One man fishing with his wife said that for him, fishing was “a break from work to spend time with my wife.” Another 28-year-old man said he had been fishing “all my life” and now was teaching his own children how to dipnet, indicating the importance he placed on fishing as a traditional activity within his family. To a lesser degree, fishers reported participating in the fishery for recreational purposes. Indeed, the atmosphere on the beach during busy days was sometimes hectic, like a fairground or street fair. So well known is this dynamic that we met a party of out-of-state sport fishermen who had come down to the beach “just to see what all the commotion was about.” Most parties had a cooler and supplies for gutting and cleaning their fish. Others brought chairs, tents, and other gear. In large groups, we observed that usually only one or two members of the party would be actively fishing while others were waiting to clean freshly caught fish or were doing other activities not directly related to the fishing (i.e., playing with children, reading, games and sports, cooking, drinking alcohol, talking to other people). Throughout the course of the dipnetting season, the beach took on more semipermanent installations as more and more people came to fish. On the northern beach of the Kenai River, a church group set up a permanent tent where they gave out free hot dogs and warm beverages to fishers. Other groups appeared to set up small kitchens around their tents, likely related to a lengthy stay (by comparison) on the beach. While only a few respondents claimed recreation as their primary reason for fishing, nearly every interview respondent indicated that the recreational component of fishing was an important factor as to why they came to the personal use fishery on the Kenai River. Other fishers, however, were less certain about the sustainability. Many respondents were optimistic but uncertain, saying “I hope so,” and “I’m not sure.” Others contextualized their uncertainty in their own behaviors and the behaviors of others. One woman said, “I don’t know. We try to be responsible, though.” Another man said, “It should be, but it depends on whether people can be responsible and not take too many fish.” He also noted that he had seen “people taking too many,” a concern many respondents shared of not seeing what they considered to be adequate representations of enforcement (i.e., Alaska State Troopers, ADF&G) patrolling the fishery. Another woman said she had, “No idea. This year seems like a slow start, though. The first year we got 35 fish in the first hour.” Her comments indicated a phenomenon we noted throughout our interviews: that fishers having strong expectations for the salmon to “show up” during particular days during the season and relating their own harvest success to past experiences and the activities of other user groups in the fishery (i.e., commercial fleet and sport fishers). A few respondents reported that they did not think the fishery was sustainable, with most citing concerns of bycatch, overfishing by the commercial Cook Inlet fleets, and lack of regulatory enforcement as primary drivers for unsustainable conditions in the fishery. 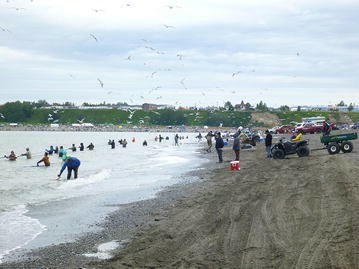 Many fishers commented about crowding on the beach, especially when we were sampling during a high tide (where there was little beach space to use) or on a weekend when many fishers from areas off the Kenai Peninsula visit the personal use fishery. During these times, the beaches are especially congested and fishers often fished nearly shoulder to shoulder, sometimes compounded by large wakes from incoming and outgoing fishing vessels accessing the Kenai River. During these periods, respondents frequently complained about overcrowding and perceived competition for fish between the personal use and commercial fishing groups. The majority of our interview respondents reported either an Anchorage or Mat-Su zip code as their place of residence, indicating that most of them had traveled a significant distance to harvest fish on the Kenai River (at least 2.5 or more hours of driving). We also asked fishers to estimate the amount of money they had spent on their trip, and many reported spending several hundred dollars over several days of fishing and travel. This expenditure and expectation of catching fish is likely then related to the complaints we frequently heard regarding sharing of the salmon resource with other user groups, primarily the commercial fleet. Both sets of interviews, while not intended or designed to be representative of all fishers in either fishery, clearly indicate that personal use fisheries on the Kenai Peninsula are important to urban Alaskans for multiple reasons, including food security, family and tradition, and recreation. For some dipnet fishers, store-bought options are simply not considered a sufficient alternative to wild-caught seafood; in some cases, this is because of high prices, but in others it is because Alaska seafood is simply not available in grocery stores on the Kenai Peninsula . For some, however, their preference is based simply on the fact that they value catching the fish themselves more than they do having the fish, regardless of where the fish comes from. Our findings match with those of Poe et al. , highlighting how urban spaces can be subsistence spaces, and demanding, perhaps, that policy recognize this reality as an important parameter for securing socially just fisheries and food systems. The constitutional requirement in Alaska that underpins these personal use fisheries may be an important case study of policy in this regard. Yet, not all people in Alaska have the time, resources, or inclination to fish for themselves, meaning that food systems which emphasize direct access to wild foods through individual harvests may still fall short of ensuring equitable outcomes for all (see also, ). Some form of blended approach to fisheries governance that also promotes affordable access to seafood through local markets is likely important to truly achieving sustainable food security. This aspect of how many urban residents value the personal use fisheries—the value they see in catching the fish themselves—is important also because it reinforces what we know about food security as encompassing more than just mere access to calories and nutrition. It also challenges persistent stereotypes about urban peoples being disconnected from or apathetic to their proximate environments. Specific foods and food procurement traditions, and how these fit into identity, culture, and social relations have been discussed as important to rural Alaskans , and they are clearly important for urban residents as well. Many fishers talked about the importance of time spent harvesting, and one fisher specifically described the activity as part of Alaskan culture. The same was observed for clam digging: that people consider the practice important to their food security, despite the fact that the total harvest does not contribute significant overall calories or nutrition to their annual diets. The clams are important as gifts, as foods consumed during special occasions, and the digging itself is a valued family and cultural tradition. Given how important people’s connections to their environments can be important both for their own well-being and also to the likelihood of achieving sustainable practices [26–29], these personal and cultural aspects of the clam and salmon fisheries should not be undervalued. Multiple people from both fisheries also expressed concern over the future sustainability of the fisheries, and responses to our questions on this topic produced several main themes. First, many respondents associate the presence of regulations and regulatory enforcement officials as indicators of a sustainable fishery. This high level of trust in the process of management is noteworthy given the rancorous conflicts over fisheries in this region . Some respondents interpreted the simply abundance of fish and their opportunity to harvest them as signs of a sustainable fishery. Likewise, many situated sustainability as a matter of individual responsibility and collective action, but noted too that this can be problematic if others do not act in the same manner. To that point, many dipnetters also indicated that they have limited familiarity with the fishery and admitted that they pay little attention to the fishery outside of the fishing season. By comparison, those people with concerns for the clam fishery all had many years of experience digging on these specific beaches, and their concerns regarding overharvesting were ultimately confirmed when the beaches were closed to digging in 2014. Collectively, these themes evoke the tensions that can exist among the benefits of so-called command and control management in the case of a high-demand but limited engagement fishery , and the development of local ecological knowledge through more intimate, long-term engagements as an important prerequisite to effective natural resource stewardship . In the case of the salmon fishery, people willingly admit that they may lack the necessary expertise to make a fair judgment on sustainability, but because they consider the fishery so important to their lives and families, and they lean heavily on expert-based knowledge and management. In the case of the clam fishery, however, there may be an opportunity to improve future outcomes by engaging local knowledge. As noted before, the majority of our interview respondents were from the Anchorage or Mat-Su area. The popularity of the dipnet fishery on the Kenai River has grown significantly since permits have been issued; only 14,576 permits were issued in 1996, whereas 34,315 permits were issued in 2012 (ADF&G permit data, 2016). Similarly, the total harvest of the personal use fishery on the Kenai River has grown from an estimated 107,627 fish (all salmon species) in 1996 to an estimated 535,236 salmon (all species) in 2012. From these growing numbers, it is clear that the fishery has become more and more popular over the years with many people from around the state taking part. While our sample size is too small to support conclusions representative of all users accessing the dipnet fisheries, we nevertheless have evidence (approximately 79 % of fishers we interviewed were from the local urban area) that this fishery is indeed providing the urban population, indigenous and Euro-American alike, with an opportunity to harvest fish and engage in nature-oriented recreational activities. As mentioned, personal use fishers generally seem to value the access to food that these fisheries provide above any other benefit. However, dipnet fishers also complained of crowds, fish refuse left on the beach, litter, and the struggle of fishing during times of heavy boat traffic on the river, all of which underscore the importance to them of environmental quality and quality of experience. If the dipnet fishery continues to draw such crowds, then these environmental impacts are likely to persist. Some work has been done regarding fuel pollution in the Kenai River from 2-stroke outboard engines on dipnetting boats , and measures such as cordoning off access to ecologically sensitive grassy dunes surrounding the fishing area have been taken to curb the damage done by heavy foot traffic during the fishing season. However, to our knowledge it appears that little other research has been done that investigates whether the high human traffic is having negative impact on local environmental quality. Additionally, the personal use fishery has become heavily politicized, as it emerges as a significant consumer of Kenai River salmon in the already contentious atmosphere of allocation wars in Upper Cook Inlet fisheries. Other user groups, notably the commercial gillnet fleets in Cook Inlet, view the personal use fishers as a poorly informed yet powerful voting block . Indeed, some personal use respondents did indicate strong negative feelings about the commercial and sport fisheries, though most appear to be willing to share the resource. The State of Alaska, for its part, supports the dipnet fishery by providing some regulatory measures (such as catch reporting cards and ADF&G oversight) as well as maintaining few barriers to entry (permits, up to now, are free to obtain). Locally, the City of Kenai has taken on the task of providing restroom facilities, local enforcement, parking services, beach cleanup, and a number of other services that are not without cost (Personal communication, August 24, 2012). While the City does reap some benefit from the increased traffic to local businesses and some built-in fees, the demand on city personnel and resources is significant. Despite these burdens, the personal use fishery appears to appeal to a sense of independence and entitlement, as many people across Cook Inlet user groups indicated that they place the Alaskan “ability” to harvest one’s own local food as paramount to nearly any other use of salmon. This personal use fishery cannot be fully understood without contextualizing it within the broader social conflict over fisheries that has characterized the region for decades ; personal use fishers represent the largest and fastest growing user group in the fishery and this growth has garnered its own attention within this conflict. While many members of user groups may understand and respect people’s desire to harvest food and engage in fisheries-based recreation, they hold those values alongside a strong desire for equity and sharing of conservation burdens. As the personal use group represents a large but casual consumer of the Cook Inlet salmon resource compared to the smaller but professionalized and well-organized commercial and sport fishing user groups, it is possible that confrontation between these competing sectors will increase during years of low abundance . Most commercial-caught Cook Inlet salmon is exported out of Alaska, though it is clear that there is a local demand for affordable, fresh and frozen Cook Inlet salmon. While it is outside the scope of this study, it is possible that improved access to local-caught seafood in Alaskan food markets would decrease the direct, personal use harvest pressure on the Kenai River, or at least provide alternatives to those fishers who are not successful in their harvest efforts. Redirecting commercially caught wild seafood toward markets in Alaska may also change the image of commercial fisheries in the minds of some locals, from its current state of being economically focused (as reported by some dipnetters) to that of an important food provider for Alaskans (at least more so than it already is). However, improving local access to Alaska seafood through traditional commercial means should not be seen as a panacea to either the contentious nature of Cook Inlet salmon fisheries or the pressures of currently experienced on the Kenai River dipnet fishery. Our results make it clear that while access to locally harvest salmon is a driving force behind the fishery’s popularity, the recreational, traditional, and culturally values placed on the fishery are of significant, if not equal, importance to many users. Poe and colleagues clearly show how urban harvests are situated in unique political ecologies, with issues of social justice being at the forefront . Indeed, it is always possible that when “uses” of landscapes and seascapes are managed by the state, that some uses and users will become privileged over others within the dominant narrative of resource development . Personal use clam fisheries may be a case in point; though long present in the peninsula, they “fly under the radar” so to speak, in terms of their contributions to local people’s food security and culture. This is despite documented participation by Alaskans in the fishery for 50 years at least and by Alaska Natives for far longer than that . According to harvest survey data collected in 2011, 30 % of Kenai Peninsula residents harvest clams , and two-thirds of those are from low to medium income households (Loring and Harrison, unpublished data). While the clam fisheries likely no longer represent a significant contribution to local food systems in terms of calories or nutrition, this research suggests that their contributions are nonetheless numerous. The activity of digging is a treasured family tradition for many, and the clams appear to be thought of by many harvesters as something of a local delicacy, considered important for gift giving and special occasions. If you choose to harvest shellfish in Alaska, it is important that you know the facts about [paralytic shellfish toxin], know the species you plan to harvest, and know the symptoms of paralytic shellfish poisoning and get help quickly! [38, emphasis ours]. Whether the state can excuse itself from this responsibility is a question perhaps for another paper , but what is clear for the discussion at hand is that the clam fishery is in a gray area as far as being a state-sanctioned space for food procurement: ADF&G monitors the clam populations and tolerates harvests as long as they are not a threat to conservation, but fall short of validating this activity as anything more than recreational. One final point of comparison among the two fisheries involves the dramatically different atmospheres they exhibit; dipnetting is a chaotic, festive event, where crowds, noise, bonfires, tents, beer, and a high-intensity atmosphere the norm. By comparison, clam digging is a quiet and solitary affair, described by one interviewee as “meditative.” The “messiness” of the dipnet fishery has been a target of criticism, with the implication that the apparent “free for all” indicates an inherent unsustainability of the fishery—an highly visible example of the tragedy of the commons, perhaps. However, with the caveat that we know of no research exploring the ecological impacts on the beaches themselves, there is no evidence that the dipnet fishery on its own is unsustainable. Further, we know from this study that the fishery is an important way that these people interact with the environment, and many participants likewise hold sustainability of the fishery as a top priority. While the impact on the ecological environment may be yet completely understood, the effect on the City of Kenai and pressure on the dipnetting beaches has been more acute and apparent. Restroom facilities, waste disposal, beach cleaning services, and significant traffic congestion are new features to narrow streets of Old Town Kenai, a popular access point to the Kenai’s dipnetting sites. In contrast, the Kasilof River has not experienced such a boom in visitation and accompanying infrastructure, due largely to the smaller and less consistent run of salmon returning to the Kasilof. In past years, the Kenai River Chinook salmon fishery has been open to dipnet fishers (though keeping of these fish was prohibited during the years of our study). The Kasilof River does not permit the keeping of Chinook, perhaps making it less popular for those who are fishing for primarily recreational purposes. The differences between the same fishery on these two rivers are important to note, as a local preference for a quiet and less rowdy fishing atmosphere may drive, at least for a time, an increased demand for dipnetting opportunities on the Kasilof River. At play here, perhaps, is a cultural bias that expects local food harvests to embody some bucolic esthetic, a bias common within local food movements and one that may contribute to many failures of these movements to serve more than just the middle and upper class members of society . Urban spaces are densely populated, and it makes little sense to expect that a large-scale individual access fishery in an urban area will embody a rural feel. Rather, the still young dipnet fishery may be evolving into something more similar, perhaps, to the large-scale, vibrant and busy street markets common to urban centers in Southeast Asia. Alaska being a state that is still generally low in population compared to its vast geography, it is not surprising that many people who are otherwise accustomed to low-density fishing experiences would find the atmosphere of the dipnet fishery jarring or troubling; nevertheless, as long as the activity does not prove detrimental to environmental health and quality, people’s expectations may change with this over time as the fishery becomes more institutionalized within urban Alaska culture. As with Poe and colleague’s work in Seattle , what we see in these two personal use fisheries are wild food harvests that “contribute to many urban residents’ lives by supporting subsistence, cultural practices, and enhancing quality of life” (p. 410). As with the non-timber forest product harvests discussed in their study, our findings show how important it is to understand personal use seafood harvesting as a way in which urban Alaskans, and perhaps especially low-income families, assert their rights to wild resources and to engagement with their environments more generally. In this, urban harvesters are perhaps more similar to rural harvesters than they are different (see, e.g., [24, 41]). It is also important to understand these urban fisheries as more than simply wild food harvest, but also as important cultural, social, and, in a way, traditional activities for Alaskan residents. People engaging in both the personal use salmon and clam fisheries care about the ongoing sustainability of these resources both in terms of a local food source and a resource that is tied to feelings of Alaskan identity and agency. Additionally, fishers engaging in small-scale food fisheries play an underutilized role in supporting the local economy on the Kenai Peninsula, and on a global scale, are participating in well-regulated, sustainable salmon fisheries instead of purchasing fish harvested in exploited, industrialized fisheries from outside Alaska. Cook Inlet food fisheries provide excellent opportunities for many directions of future research. Not much is known beyond the data reported here about the people who participate in these fisheries, the extent of their varied ecological and societal costs and contributions, and a variety of other topics. For example, in the sphere of food security, we have previously argued that there is an opportunity to improve both Alaska’s food security and the sustainability of local fisheries by creating an artisanal market for locally caught seafood that is separate from the larger commercial fishery [1, 30]; future market research could be undertaken to determine the willingness of urban harvesters to purchase such artisanal products at the grocery store or docks instead of harvesting it themselves. More generally, our research contributes to the increasing recognition of the ecological dimensions of urban life, rejecting the notions that urban residents neither have nor want close personal and cultural relationships with the environment and that there can be no “wild” in the “urban” (or vice versa). Couple this with the emerging movements to expand small-scale urban agriculture, and the distinctions between what is human, wild, urban, cultivated, or otherwise, may begin to become irrelevant and even counterproductive to how we pursue sustainability in urban regions. While dipnetting does take place on the nearby Kasilof River, it is important to note that the interviews in this study were conducted on only the Kenai River dipnet fishery and should not be construed to potentially represent views from the Kasilof River dipnet fishery, which is different from the Kenai fishery in several significant ways. An erratum to this article can be found at http://dx.doi.org/10.1186/s40066-016-0070-8. Both authors contributed equally to the research, analysis, and the writing and preparation of the manuscript. Both authors read and approved the final manuscript. Dr. Philip Loring is an assistant professor of sustainability science at the University of Saskatchewan. His research focuses on the sustainability and well-being of coastal communities, including such topics as food security, risk, resilience, and conflict. He currently works in communities in Alaska and Western Canada. Hannah Harrison is an IMPRESS Ph.D. fellow with the Marie Sklodowska-Curie Actions supported by the EU Research and Innovation Program Horizon 2020. Her research focuses on environmental and resource conflict in fisheries, as well as small-scale food fisheries and fishing culture. She currently works on rivers in Norway, Wales, France, and Germany. The data for this paper are ethnographic in nature, making it impractical to share data in a format other than this published manuscript. All participation in this study, including photographs, was given voluntarily or obtained in public places, and the people therein are not research subjects and are not identifiable. This research was reviewed and approved as “exempt” from review by the University of Alaska Fairbanks Institutional Review Board. All participants gave free and informed consent to participate. This research was supported by the Social Vulnerability of Alaska’s Coastal Communities to Climate Change Project (NOAA project NA06OAR4600179), the Alaska Center for Climate Assessment and Policy (NOAA cooperative agreement# NA11OAR4310141), and by the Human Dimensions Lab at the Water and Environmental Research Center, University of Alaska Fairbanks. Fall J. Subsistence in Alaska: a 2012 update. Juneau, AK: Alaska Department of Fish and Game; 2014. https://www.adfg.alaska.gov/static/home/subsistence/pdfs/subsistence_update_2012.pdf. Inuit Circumpolar Council Alaska. Alaskan Inuit Food Security Conceptual Framework: How to Assess the Arctic from an Inuit Perspective. Anchorage, AK: Inuit Circumpolar Council Alaska; 2015 p. 126. http://www.iccalaska.org/servlet/download?id=486. Alaska Marine Conservation Council. Local seafood. 2016 [cited 2016 May 31]. http://www.akmarine.org/working-waterfronts/catch-of-the-season/local-seafood-2/. ADF&G. Harvest info-Cook Inlet personal use salmon fishery. 2015 [cited 2014 Mar 15]. http://www.adfg.alaska.gov/index.cfm?adfg=PersonalUsebyAreaSouthcentralKenaiSalmon.harvest. ADF&G. Cook Inlet Razor Clams. Anchorage, AK: Alaska Department of Fish and Game; 2010. http://www.adfg.alaska.gov/static-sf/region2/pdfpubs/clams.pdf. Alaska Department of Fish and Game. Alaska Sportfishing Survey. 2015. http://www.adfg.alaska.gov/sf/sportfishingsurvey/index.cfm?ADFG=area.home. ADF&G. Emergency orders and news releases—Sport Fish—ADF&G. Emerg Orders News Releases Sport Fish. 2016 [cited 2016 Apr 4]. http://www.adfg.alaska.gov/sf/EONR/index.cfm?ADFG=region.NR&NRID=2059. AKDEC. Recreational Shellfish Harvesting in Alaska. State Alsk Dep Environ Conserv Div Environ Health Food Saf Sanit Program. 2016 [cited 2016 Apr 6]. http://dec.alaska.gov/eh/fss/seafood/rec_shellfish_harvest.html. Ranco D. Environment risk, fish consumption, and American Indians: exploring the logic of genocide. In: Bad Subjects, vol. 55. 2001. http://bad.eserver.org/issues/2001/55/ranco.html. Tregear A. Progressing knowledge in alternative and local food networks: critical reflections and a research agenda. J Rural Stud. 2011 [cited 2011 Jul 27]; http://linkinghub.elsevier.com/retrieve/pii/S0743016711000507.